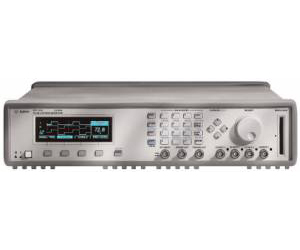 The Agilent 81104A 80 MHz single-/dual-channel Pulse Pattern Generator with one or two Agilent 81105A ouput modules: Building on the capabilities of the 81101A, the 81104A extends the frequency and adds RZ/NRZ pattern capability up to 16 kbit per channel. An NRZ strobe channel provides a trigger at any desired point in the pattern, or can be used as an additional pattern source. If two 81105A Output modules are fitted, the outputs can be added. This allows different pulse shapes for simulating glitches, testing clock-recovery circuits or generating 3- or 4- level codes. Channel-add and 1000-ohm source modes each operate up to about 60 MHz. Combined, the maximum speed is about 15 MHz..